Welcome to Southern Tier Environments for Living, Inc. Welcome to the Southern Tier Environments for Living's website! Southern Tier Environments for Living (also known as STEL, Inc.) provides rehabilitative and support services to persons with mental illness and other disabilities in Allegany, Cattaraugus, Chautauqua, and southern Erie counties. Our service spectrum includes residential treatment group homes & apartments, supported housing, single room occupancy housing, vocational rehabilitation, case management, social supports. 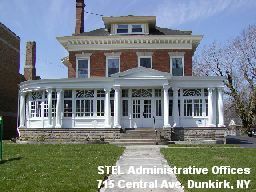 STEL also works collaboratively with other agencies throughout New York and in Western Pennsylvania to develop affordable housing for persons with special needs. Our organization is designed to help people by providing essential services that allow individuals to live as independently as possible in our communities. We're strongly committed to assisting people by promoting mental health wellness and creating environments where individuals can develop the essential abilities to live and function productively and independently. We're equally committed to assisting people in time of need to prevent psychiatric hospitalizations, homelessness, and unsafe living arrangements. Our web site is designed to share information with consumers, family members, service providers, and the community at large. If you should have any questions, comments or suggestions please feel free to contact us anytime. Thank you for visiting our web site and check back frequently for updates.